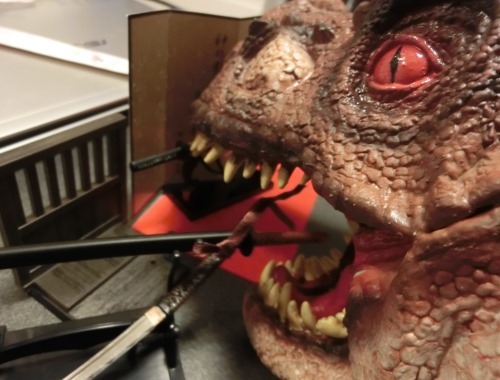 I’m going to pretend that it isn’t April fools day..
It’s hard to give you serious sword news on a day when everyone is, well, revelling in being silly.. But the digest goes out on the first of every month (except for New Years day) so to heck with it – we have that much to get through that there isn’t time for April fools gags. Well, maybe one.. See if you can spot it..
5. April Fools Lame Joke.. (Oops, darn. Gave it away already)..
Around the middle of march, just when I was planning the details for project X Chinese, guiding in what may well be the last batch of the SBG custom katana (at least in it’s current incarnation), and preparing for the upgrade of the forum and the sister site sword manufacturers guide.com (which you may have noticed, was down for half of the month), for whatever reason I could not help but think that I was neglecting something of critical importance. You see, for the last nine months I’ve been so busy in my personal life (I’m a fulltime student in Japan studying Japanese) that for the most part my attention has been primarily on keeping the site going, answering emails, and the day to day stuff involved with running a web site that receives over 5000 visitors a day.. But in the lead up to the two week spring vacation (Haru Yasumi), instead of taking some time off, I was haunted by comments from many members of the forum that the main site is hopelessly out-dated, and that something needs to be done about it (I don’t post much on the forums these days, I rarely have the time and I prefer not to interfere unless it’s absolutely necessary – but I do READ a lot of what is said whenever I get a chance). Of course, the main issue is how to update it in a way that makes all the information contained there relevant. Even some of the reviews of now discontinued swords had gems of still very relevant information in them. But the other major stumbling block, and why it has not been updated in so long is that SBG is a very LARGE site. There are over 300 pages of information and reviews. And the majority of those pages are incredibly long and very detailed. To make matters worse, SBG has grown organically – which is great for vegetables and fruits, but not so great when dealing with a somewhat tangled website.. But I figured it was now or never. So I took the first step, drafted up a new look for the website and a new template, and posted it on the SBG facebook page..
That was the 17th of March. And while the first step was incredibly difficult, because I knew full well the scale of the task ahead of me (though not exactly what I was getting into! ), I started looking at each page one by one and piecing together the puzzle again – updating old information and prices – and began stage one of SBG’s biggest update yet…! 2 weeks later of burning the midnight candle, it’s still not finished. Not by a Longshot – which is a little bit frustrating, and at times I have looked at it and am thinking “why the heck did I start this?” – but at the same time, it’s incredibly satisfying - a real trip down memory lane. Many of these products subjected to his brutal testing have been discontinued, but the spirit behind Tsafa’s what he did was pivotal for SBG – and this article has now become a true SBG classic. Pages like this obviously need more updating than others that were done recently, but they are awesome. 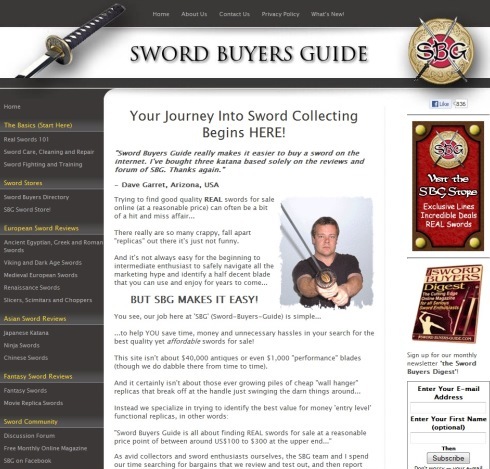 They are fun, exciting, and in short they make SBG what it is – an easy to digest beginners guide to sword collecting! Another thing I noticed is that some products had not changed in years. For example, the swords in the Ancient Swords section were for the most part still being sold, and the price had not gone up in 8 years! Other areas had been decimated – in the Renaissance swords section, almost all of the swords have been discontinued. Prices in the medieval swords section had gone down, and then back up again – in many cases to levels MUCH higher than before the discounting began (which is why I always worry for the long term future when manufacturers begin price dumping). Same with the Japanese sword section – the PPK has gone up around $50, Cheness has remained the same (though they had to squeeze their margins to do so) and the $59 swords – they didn’t go up or down, they have been fairly constant (due to volume of sales I suppose). So the first stage of the upgrade has been to update the status of the swords and balance them against each other to try and provide a helpful overview. I haven’t really added any new reviews or information yet – the first stage of the overhaul is to identify how things have changed and rewrite each page accordingly.. But it is funny in that in some ways, the more things chance, the more they stay the same.. In some ways this major update of the site is a return to the beginning. I have always been a firm believer in strong basics, something I was drilled on when I studied the (unarmed) martial arts in my teens until my late twenties. 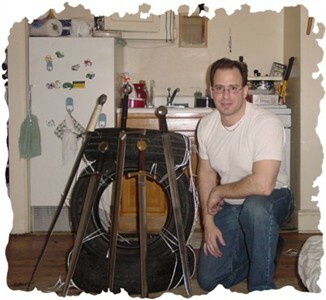 So in many respects, SBG is coming back full circle – the emphasis is still, and will ALWAYS be on the beginning to intermediate sword collector. It was never going to be ‘Super SBG 3.0’ with bells and whistles and things that will leave the beginner feeling overwhelmed or confused. Our aim has been, and always will be, to provide a balanced sampling of reviews and products that are tried and tested. The information has to be simple to understand and easy to digest - no easy task. If we present too much information – like using excessive Japanese terminology, nit picking over Oakeshott types or arguing the finer points of blade harmonics and geometry too early - budding collectors may well feel ‘this is all too hard’ and give up. My aim is, and has always been, to try and guide a beginner to a product that I feel is solid and dependable – a product that is no doubt boring or passé to you now – but maybe you have forgotten that amazing feeling when you cut your first water bottle and it feels like it isn’t there, or the first time you get that long rectangular box and you just sit there for a while, trying not to hyperventilate, savouring the moment, gingerly opening it and marvelling every step of the way..
That is, and will always be, the focus of the main site. We try to keep it simple, concentrate on the basics, and we can’t do that if we chase every new product that hits the market before it has had a chance to really prove itself as dependable and reliable, warts, blemishes and all. We don't jump in to the advanced stuff straight out - it's too much to take in and in many cases, it is very risky. Chances are you have forgotten what it was like..
Now naturally enough some of the more experienced collectors will feel that the update ‘doesn’t go far enough’ - but don't get it mixed up, the main site is primarily for absolute beginners or those people who get paralysis by analysis - the forum is the cutting edge, the next step and the place for more advanced discussions – the main site is the primer – real swords 101. Anyway, the update is still in progress. There is still a long way to go, but it is getting closer. Once all the pages have been revised, updated and re-balanced against each other there will follow several more revisions, additions and refinements before returning to a steadier pace. The best is yet to come.. In the meantime, I’ll hope you’ll bear with me..
We have had a lot of set-backs moving the SBG sword forum to a new server. While the lag has improved a little last month, it’s still pretty bad in my opinion (and probably yours too).. So on April the 7th the forums will be taken off line for a few days while it is backed up and moved to a brand spanking new server. There may be some cosmetic changes when it comes back online to match it to the new look of the main site. But the important stuff – the content itself - will be restored, and some additional functionality will also become apparent soon after the migration is complete. I think you’ll like it, but I wanted to give you all a heads up that it will be down for a while in the process. In last month’s issue of the digest you might recall that preparations were being made for the next of our Project X swords – but with an authentic Chinese flavor. Well, while they site overhaul has taken precedence and the project has been pushed back slightly – some significant steps have been taken to bring it to fruition. We decided to only offer ONE of the two swords we talked about last month – the Jian. 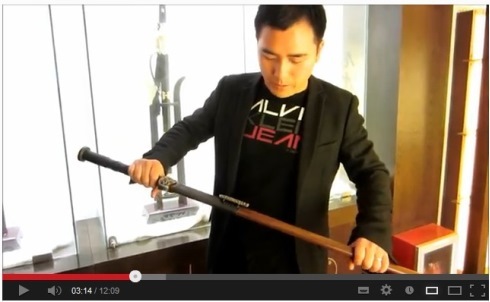 To further explain how we came to choose this particular Jian, below is a video Chris took interviewing Master Xiaolang – it’s a bit long – but VERY informative. It is called the Jian of Marquis Yi – and while you can see from the price tag that it sells at their high end showroom for RMB15,800 (approx. US$2,543) to wealthy Chinese businessmen and collectors, a handful of lucky people will soon get the opportunity to get a premium pre-order in at a hugely reduced price of $1,499 – a truly awesome deal especially when you factor in the additional costs of import duties and taxes, freight and insurance (or if you wanted to get it yourself, a plane ticket to Longquan plus local transportation costs – Longquan is not serviced by trains or planes, you need to bus it in or get a local to take you there). This offer is not for everyone – this is the real deal, and the real deal never comes cheap. But with this steep discount pre-order opportunity, you can save some serious cash and get a true Museum quality blade at a fraction of it’s true value. Pre-orders will commence in mid to late April and they will not be open for long, so if it is something you think you are interested in more information don’t delay, sign up to the list now..
SBG Custom Katana – A Glimmer of Hope? As many of you are no doubt aware, the future of the SBG custom Katana series has been hanging in the balance for some time now.. Normally in the past, as one batch leaves the forge we start taking orders on the new one to keep the forge running and minimize the gap. But due to recent delays with every batch, an increased and unacceptable error rate and the stresses of managing the project – we decided to put the project on ice and concentrate on getting everything cleaned up and decide if it is really something we wanted to continue to do (especially as the project tends to run at a loss and is, to put it bluntly, incredibly time consuming and totally exhausting). But the emails coming in from previous customers and prospective custom Katana buyers had been very encouraging. Many people said ‘raise the price, I just want in on this’ – which was option 1. Option 2 was a redesign of the project to try and make it more consistent and option 3 was to continue the clean up and relegate to the project to SBG history. Well, after looking at it from many different angles, it looks like we may tentatively be going with option 2.. It sounds funny to offer a custom katana but increase the consistency. After all, a custom Katana is a highly personal thing – but as funny as it sounds, it is what we have been doing since the beginning. Offering a smorgasbord of options and allowing you to mix and match to create something unique. The issue was, the number of options were too numerous in the end, we added in too many choices, and we are paying for it now.. However, during my negotiations with the forge, I was able to source some additional components – and think that I may be onto something.. 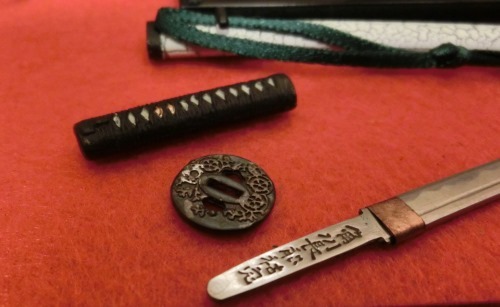 If you are interested, check out my most recent SBG custom Katana blog post here. Richard Furrer from Door County Forgeworks, a modern day Blacksmith attempts to re-engineer one of the famous Ulfberht swords, swords made with Crucible steel using secret techniques to create a superior sword that has defied historians understanding for decades..
Also with Richard Clements from the ARMA cutting tatami with a blunt sword (I love that test). 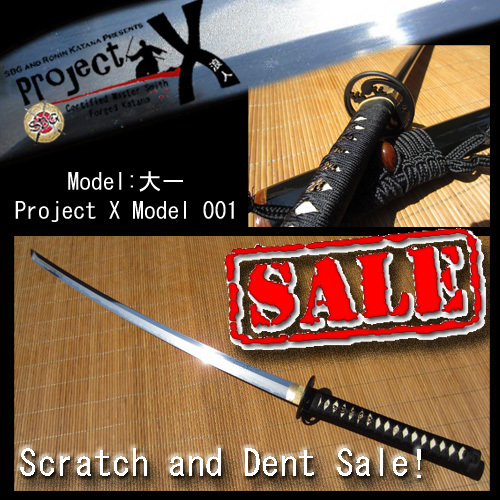 SBG SWORD STORE – PROJECT X SCRATCH AND DENT SALE! 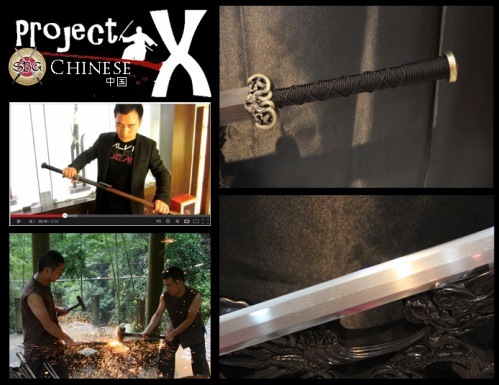 Project X was a huge success – we have now sold all but 1 of the Katana we made last year and that I went to Longquan China to see being made in person. 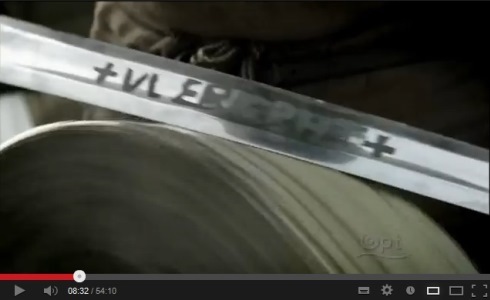 But despite our best QC efforts, we have a handful of swords from Project X that were not quite up to standard. Now there is nothing seriously wrong with any of them, a few scratches and dings to saya mostly – but also a few marks on the blades that were either sustained in transit or were not as pristine as what we aim for with this line. But if you don’t mind a little reworking, here is your chance to pick up a master smith forged Soshu Kitae Laminated blade with full rayskin wrap, sword stand, wooden display box and all the other features that set this line apart at savings of from $150 to $350 off the normal price! 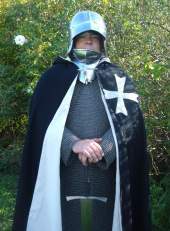 We have a total of 7 swords for sale, all the exceptionally popular model # 001. 5 of them have relatively minor blemishes and/or scratches on the blades and minor dings and dents on the saya and these are $800 a piece, 1 has some minor blemishes on the blade, but the saya is fine and this one is $850. 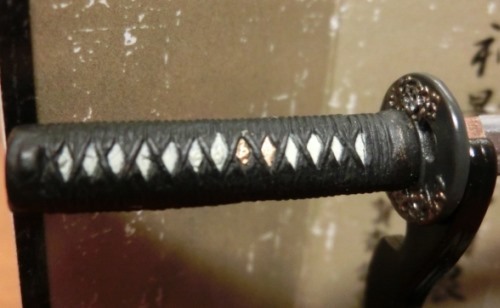 And one has some serious saya damage and some minor blemishes on the blade, this one is $650. As with the Ronin Katana scratch and dent sale, it’s not possible to take photos of each of these swords. Assume they will take some work to get them to pristine condition. Since this is a scratch and dent sale, all swords are as is, and there are no refunds. Since Project X is making it’s foray into the high end custom smith Chinese Jian and Dao market, this will be your last chance to pick up a Project X blade until Winter/Spring next year. Real Made in Japan Katana Tamagahane Nihonto for sale at SBG! As many of you know, these days I live in Osaka, Japan. The benefits of living here are many, but one of them is of course my proximity to real Japanese made swords. Recently, I managed to pick up a truly awesome Katana when wandering down Dragon Street in Tokyo. At least, I think it was Dragon street, might have been Tiger Avenue (or was it Pigeon lane, can't really remember as these aren't normal street names or addresses in Japan, but I digress).. Anyway, it was somewhere it Tokyo..The point is, the guy selling it had no idea that it wasn’t the typical stainless steel Tourist junk you buy there, but he had slapped a typical Tourist junk price tag on it by mistake..! Ha! I tried to keep my cool, forked over around $50 and – waited. The guy took forever wrapping it (typical problem in Japan so I told him ごめんね、ちょっと急いでいるので、このままでいいですよ) so it wasn’t wrapped so well and it slowed me down as I navigated the crowds to catch my Shinkansen bullet train back to Osaka, but I was too slow, darn it..! The next one was a whole 5 minutes later..! How inconvenient.. Anyway, long story short – I got home and took some time to examine it. My fingers were trembling. I checked the blade, and sure enough – it was magnetic.. It wasn’t stainless..! Here’s a mini review for any prospective buyers.. This Nihonto is ultra-traditional, with a fully tempered, mirror polished, light saber razor can split atoms sharp real authentic made in Japan hamon temper line. Look at it shine. The tsuka is amazing. It features white colored, fully Japanese rayskin wrapped, triple reinforced tsuka under black colored, so tight that you cannot peep under it and even air can’t get in jet black, dark colored Japanese made ito (that was made in Japan by the way). To take it apart I had to get permission from the head of the Nihonto Board of Directors Grand Master, pray at a Shinto temple and drop a scarf onto the blade in homage (that fell into two pieces moments before it hit the blade). You can see the signature of the smith, and note – because this is a made in Japan, amazing quality blade the mekugi holes HEALED as soon as it was taken from the tsuka with one tap of my pinky finger (the friction fit is amazing, never mind two mekugi - it doesn’t even need ONE mekugi!). Unfortunately I was unable to complete the review with test cutting as I was hoping too because of a random Godzilla incident.. However, as this is a Nihonto, it was of course completely undamaged during the attack. Phew.. Anyway, here’s the best part – the price! Now normally the cheapest Nihonto I have seen here in Japan tend to be in Shirasaya and start at around US$5,000.. But since I paid $50, I am selling it for just $74.99 plus $3,000 shipping (and you get a full refund if you don’t like it, minus shipping fees of course). I plan to use the money on a deposit to buy one of those AMAZING $17,500 Gunto swords from that amazing webstore, oh what’s it called - machinestampedswords.com I think. Something like that..
Got to get back into it, no rest for the wicked as they say..
Hopefully it will all be completed by this time next month. Fingers crossed, so until then, Happy Easter, Happy April Fools and Happy swordening Folks..!